Oppgaven tar for seg den engelske renessansen. KOmmer blant annet inn på reformasjonen og Queen Elizabeths styre. 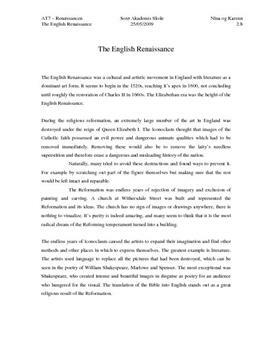 The English Renaissance was a cultural and artistic movement in England with literature as a dominant art form. It seems to begin in the 1520s, reaching it’s apex in 1600, not concluding until roughly the restoration of Charles II in 1660s. The Elizabethan era was the height of the English Renaissance. English as the lingua franca of the world?